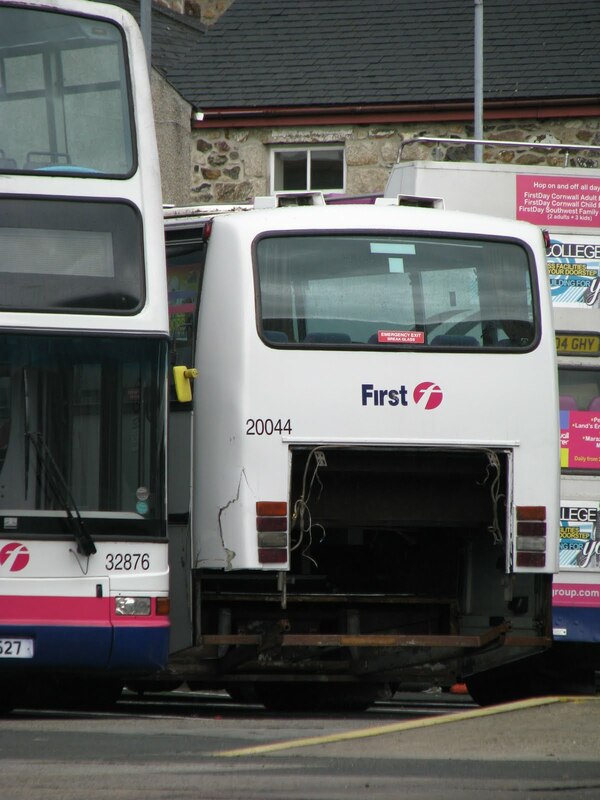 At Camborne this week things didn't look to good for Van Hool bodied Volvo, GIL 2967, previously thought to have been Sherings E634UNE. 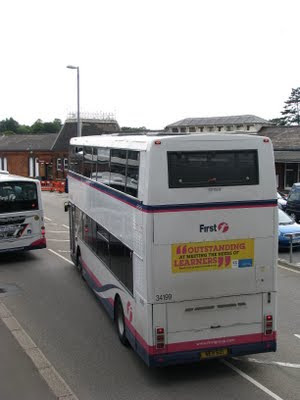 I say thought, because this coach, and another very similar Van Hool bodied B10M have both carried GIL 2967, and have ever since had confused identities to as to which one is actually which! 20044 certainly seems to be a Sheringsish spec, but the other GIL 2967 was also new to Sherings. But then we get even more confused, because the registration the 'other' GIL 2967 carries now, isn't its original registration. It got caught in a mix up when Parks of Hamilton bought some of Sherings' B10Ms, of which we can presume they were both part of the same batch, but then got separated, presumably at that point! Ironic therefore that they both ended up with the same registration, after being apart since 1991. But anyway, this is getting far too confusing! The point of the post is to show that GIL seems to have been in an incident! Possibly a rear end shunt from a car, or maybe some driver error, but it doesn't look too good. Maybe we can hope that panels have been stripped off so that she can be repaired, and not that the panels have had to be removed because they were damaged. I sorely hope we don't lose her from the FDC coaching fleet though. As is seen below in her happier times, she's worked hard over the years, and yet escaped me on a constant basis! I really would like a ride on her before she finally does bite the dust. 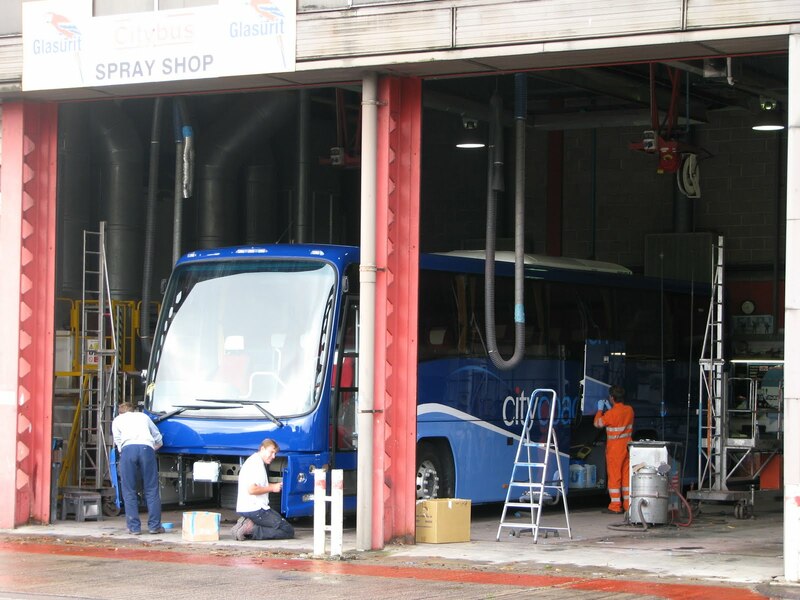 The Van Hool bodywork keeps her looking relatively modern despite her real age, as with any Van Hool bodied vehicle. 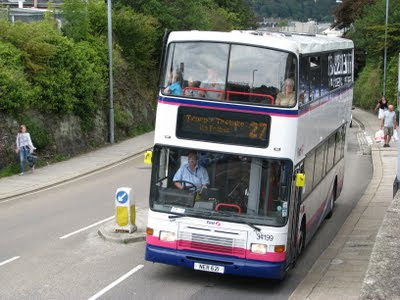 She is now the oldest of the coach fleet now that XFF 283 has been withdrawn. When I say XFF 283, I don't mean the Volvo B6! 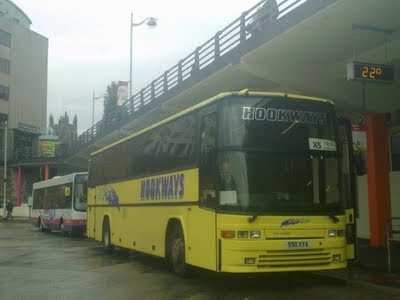 I mean D505 GHY, a Van Hool bodied B10M new to Badgerline! 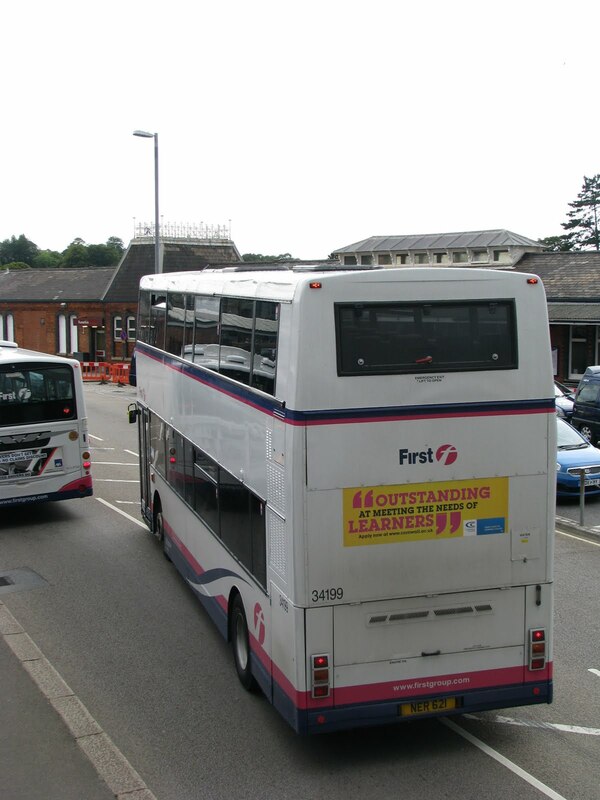 When D505 (XFF) was withdrawn, the registration was kept, and now it bolted onto one of the Tavylinx Volvo B6s, YJ51 RHY! Now, who else is totally confused! Bloomin' private registations!! Now here's a mode of transport I don't seem to post about often enough! Possibly because it changes less often, or I don't observe it closely enough. 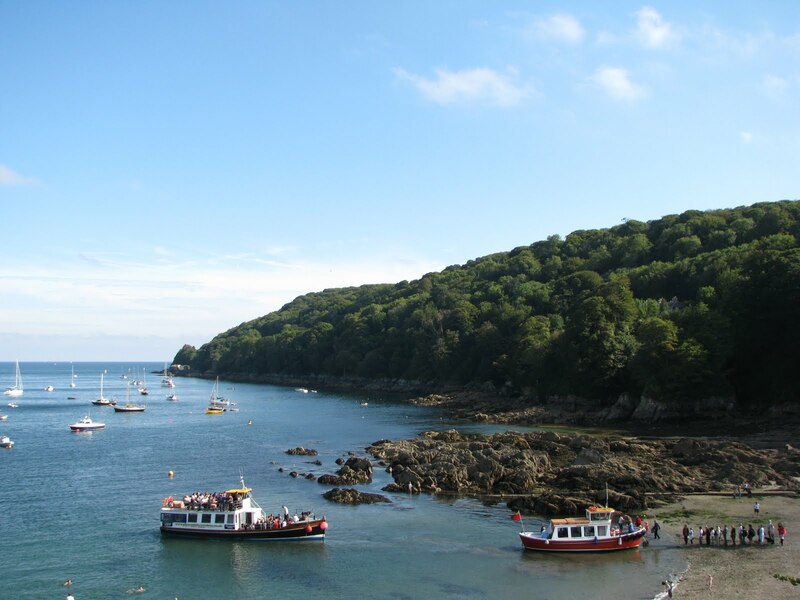 But anyway, here we see a view in Cawsand Bay, with the Weston Maid picking up her passengers for the run back to the Barbican, along with the Devon Belle running as a duplicate on the 4:30 service. 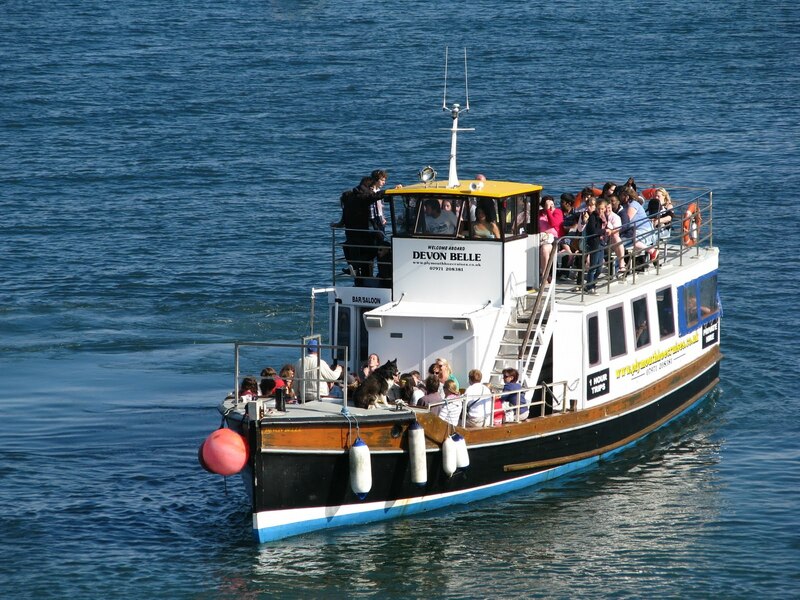 With the great weather last week many people have been popping over from Plymouth enjoying the ride on the ferries, so Devon Belle was brought in to cope with the heavy loads. Great to see people really using public transport to its full advantage. Its a shame the Cawsand Ferry service doesn't start until 9:00, meaning commuters can't use the service. I'd certainly be happy to use it if the opportunity arose, as I'm sure many others would to, rather than having the arduous trip via Torpoint in their cars. The Ex-Truronian Mercedes Citaros are coming to the end of their lease, and therefore First is bringing in some 'new' buses to replace them as we speak. 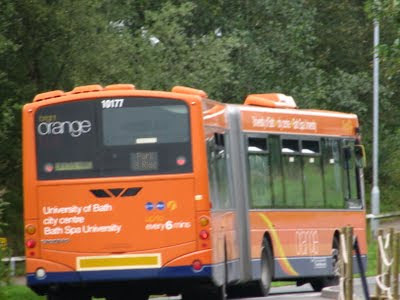 The buses are again in bendi format, and are the Ex-Bath Volvos which have been used on the University service up until now. 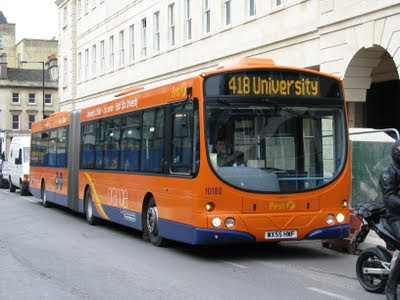 While passing through Eden on the X5 I managed to grab this very crude shot of 10177 still wearing the Bath University branding. Pictured below is of her playing her trade on home territory, along with 10180 which I presume will join her sister in Eden at some point in the near future. Now these are some of the last buses I would have expected to be re-painted in the FDC fleet! But here you have it, the N reg Airbus Volvo Olympians have been going through a re-painting programme over the last few weeks down in Cornwall, and, it is true, they do look at lot better for it. Here pictured is 34199 looking very smart in Truro operating the 27 from St Austell. All I will say, is I don't like the new scheme for the grill! I much preferred the black grill pictured below, as well as the extra blue band around the windscreen. The Olympians that have more recently arrived in Cornwall are painted in this way, so I presume this has been done to blend in with the rest of the fleet. Of course many of you will remember when this batch came down to work the X80s, and were branded up with the banner "Take it easy". I would presume this was the last time they were re-painted (until now of course), so has been a fair few years. 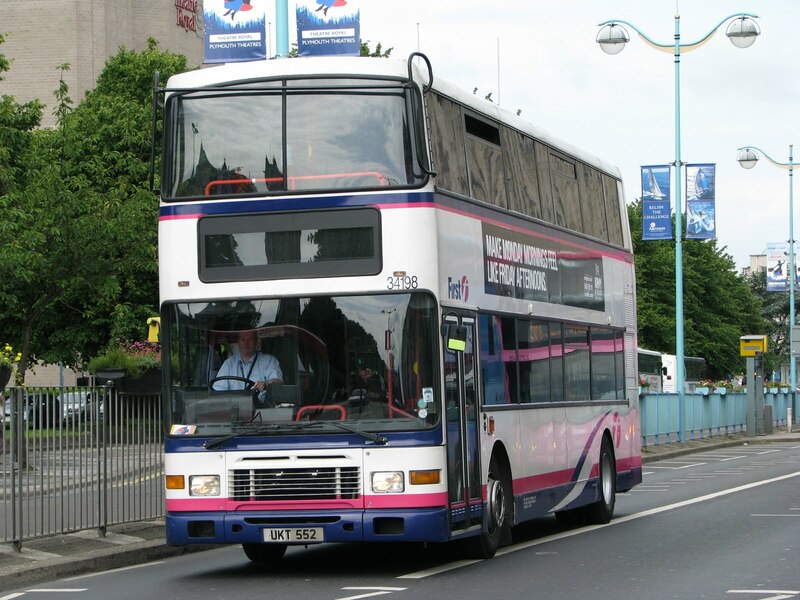 The last of this batch to operate in Plymouth was 34198, which hung on for several months longer than the rest of the batch which were moved down around the end of 2008. 34198 is registration UKT 552, but is 'famous' for the fact for a few days(?) she ran around with UKT 522 after her number plate was re-printed! I certainly miss them in Plymouth, but really are ideal for the routes around Cornwall, in particular the X18, where you can see them having a really good air out along the A30! These still shift, and tackle the various hills of Cornwall with ease and grace. So hopefully, seeing them being re-painted now is a sign that they do still have a fair few years longer to run in service before being withdrawn. Saturday saw myself head up to Swansea to have a look at the local bus scene in general, but mainly, to ride on First Group's very last Bristol VR, MOD 571P. 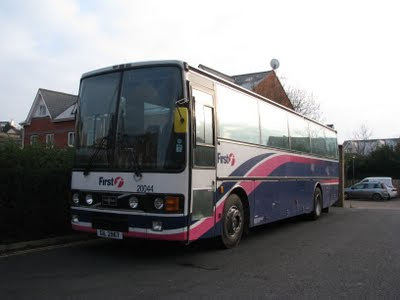 Its a long story, but to save you the endless details, after waiting around for 2 hours because of the 'lunch break' in the timetable, the VR failed to turn up, and in its place was a Volvo Olympian. I'll leave it to you to imagine my sheer disappointment in this. I went over to ask the driver why it wasn't out, to which he replied that because it was raining early that morning, he took the Volvo our rather than the Bristol. Its a shame though that someone from the depot couldn't have broken out the Bristol for the afternoon shift, but there we go. To make things worse, the driver in his strong Welsh accent commented "Well at least this one's a nicer drive". That was the nail in the coffin for my patience that day! 400 odd miles, for an R reg Volvo Olympian. God. Anyway, the positives. 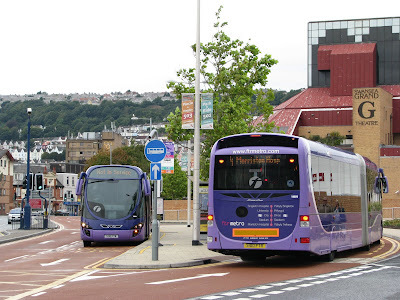 I managed to track down a few of the 'mini' Enviro 200s that had been in use in Plymouth until early this year. 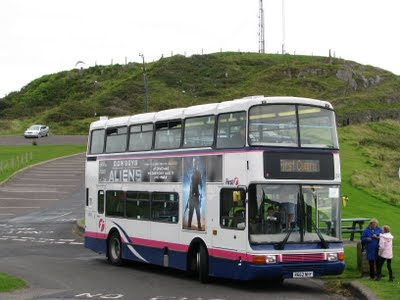 I also saw WK56 ABZ, the Ex-Truronian Enviro, which I was particularly keen to see, but sadly, couldn't get a photo from my vantage point on a Dart. A few photos of them playing their trade in Swansea can be seen above. 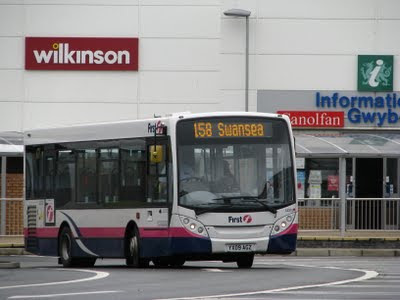 Swansea operates a lot of shorter buses rather than full length ones, so I presume these probably saw off some of the older 'short' Darts, when they arrived in the town. Some of Plymouth '56' reg full length Darts were also transferred along with the Enviros, and WA56 FTZ sits here in the bus station before working to Rhossili. I must admit, these I'm certainly not missing! 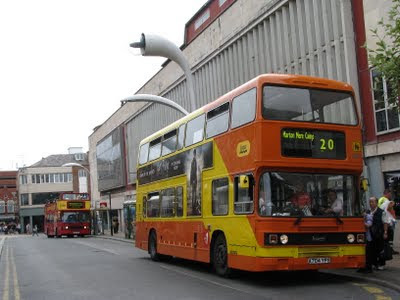 Never liked the Transbus Darts. 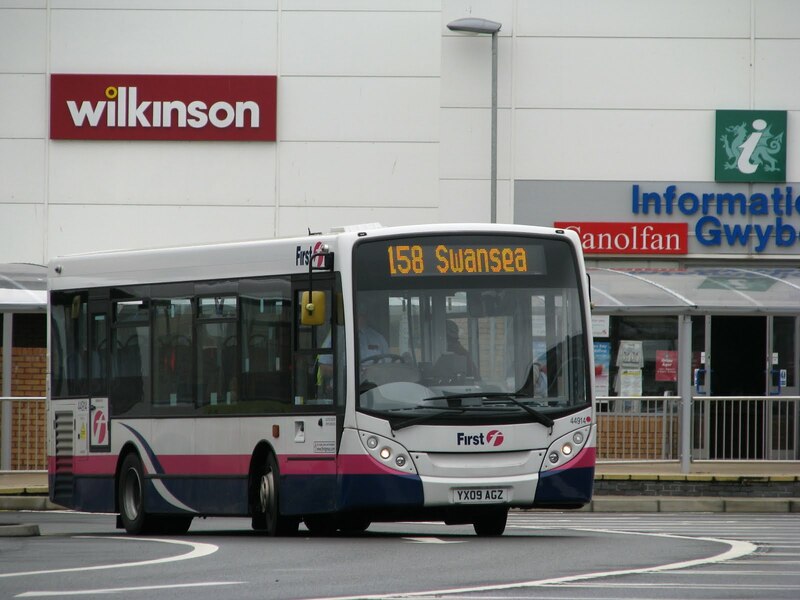 The other big feature of Swansea, is of course, the 'ftr'. Well, I'm not really very convinced. True, they have brought countless priority measures to the city, which really does speed up the services. But the buses themselves really weren't that nice. The seating arrangement on these is incredibly inefficient and seems mainly designed for standees, not particularly ideal considering the sheer size of these buses. At 19 tons these by far outweigh a standard bendi, but really don't appeal. I would imagine these absolute drink fuel as well! Some more of the new livery! With thanks to Tom Pearce, I can bring you this great lineup of all three of the Plymouth Citycoach/ (Just) Citycoach, liveries currently in use. I'll leave it to the to you to decide which is best! Please do feel free to air your opinion on the comments section below. Personally, I prefer the oldest one! 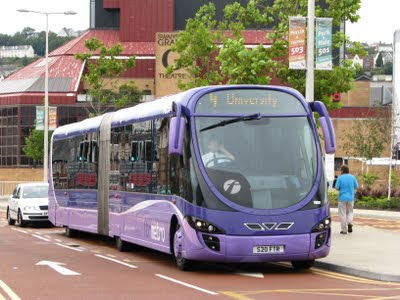 I would say this still does look modern, but it suits the lines of the buses better than both of the newer liveries, and the contrast of colours along the coach adds a bit more 'interest' to the appearance. The lighter overall appeal of the livery is also nice, compared to the darkness of the newer one. At least it won't look as dirty I suppose! 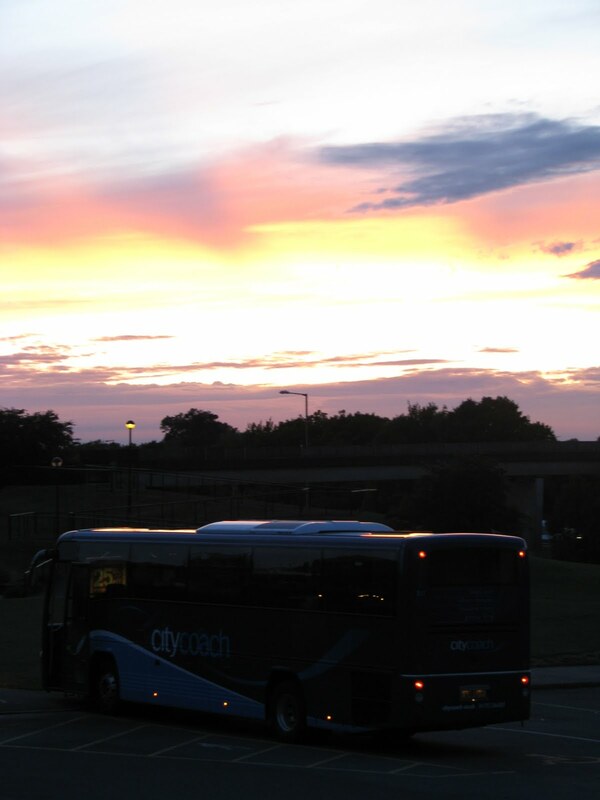 The 4th photo shows be being lucky enough to have the new Volvo on my trip to Cardiff and back yesterday! So here she is stopped in the evening sunlight at Taunton services. A big thanks to Jamie Limb for this story sent to me from New Zealand where he is currently on holiday. 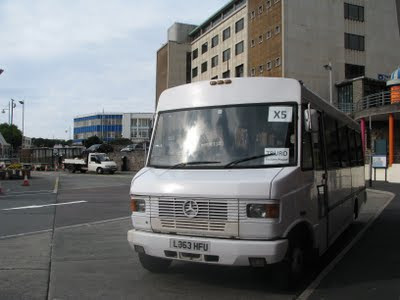 This, believe it or not, is Ex-Western National ODV 78M, which served in Plymouth for much of its life at Western National. ODV was quite a special bus for several reasons. Firstly she was the only M registered VR to be bought by Western National, and therefore is in a batch of its own. Secondly, she is a Series 3 prototype, which looked very similar to the Series 2 when new, but was modified through the years to bring her to full Series 3 standard. And thirdly, she was one of only 9 Leyland engined VRs new to WN, with the rest being delivered with the classic GArdner 6LXBs. 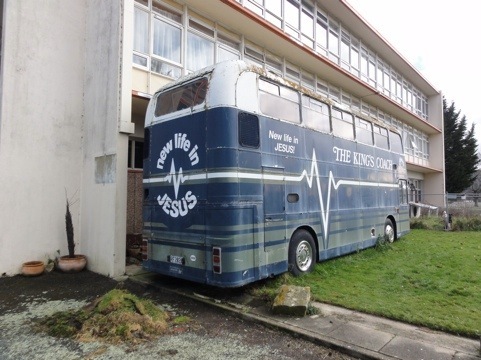 ODV has been in New Zealand for over 25 years, in which time she has been used as a promotional vehicle and in use as a mobile church. 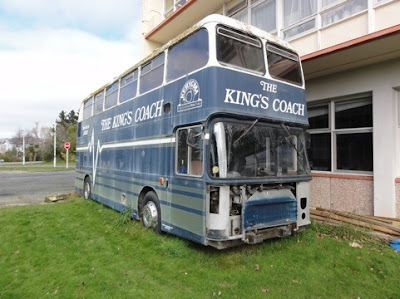 But as can be seen here, she looks pretty abandoned in at the moment, seen down the side of a cheese factory between Dunedin and Omarau. A real shame this has been left in this state. She'd certainly be an interesting and worthwhile preservation prospect, but in this state, it appears there would be quite a bit of work to get her back up to scratch. And there is of course the fact, that she is half way round the world! Still though, a really interesting find, so well done Jamie for being so eagle eyed in finding her! As I'm sure many of you are aware of, Exeter based operator, Hookways, went into administration recently, and since then the company has started to be disbanded as the routes are dispersed to other operators, and the fleet is pulled apart. This Jonckheere bodied Volvo B10M is believed to now be owned by Jackett Coaches, and is seen here this morning operating the X5 to Truro. What I should have done to confirm the move, was to look at the legals, but didn't think of that at the time! Its that a little bit of Hookways will be viable for a little while longer though. A statement that has always stuck with me was when a fellow enthusiast stated "You can never go to Exeter without seeing a Hooky! ", and how true was that! Exeter really won't be the same without the bright yellow fleet operating around the city, and indeed the region anymore. A very well established company, which is/was 82 years old this year going under, really shows how tough it is for the operators of the region at the moment. This is the second 'large' operator in the region to go within this recession, the other being Dawlish Coaches around this time last year. 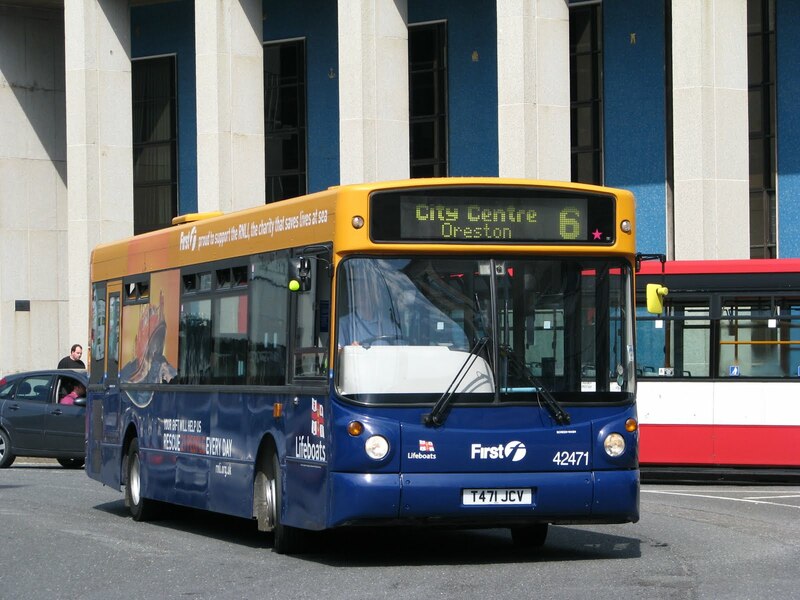 As Plymouth Citybus continues to add more of their double deck B7s, we see further single deck B7s disappear from FDC's Plymouth fleet. 69218 and 69219 (MX56 AEG/J) have been with us in Plymouth for quite a while now, effectively 'on loan' from Cornwall while in the height of the bus war with PCB, with the extra Ugobus routes in full swing. 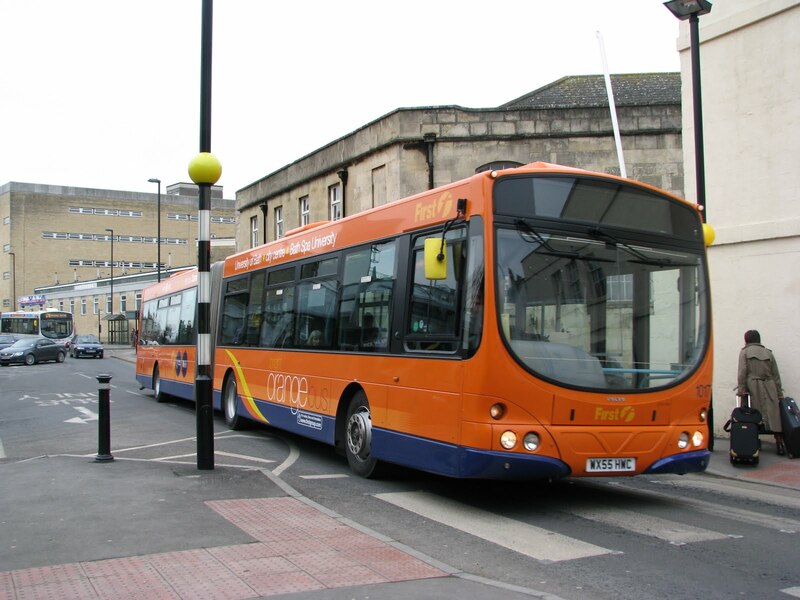 Now a majority of these routes have trickled away, the demand for high quality buses has also dwindled, and therefore, the two remaining '56' reg B7s have gone back home to Camborne and are again working with their sisters on the 14/18 from Truro to St Ives and Penzance. Shame to see these two go, as I, by far, prefer these examples to the 5 '07' reg ones that are still operating. The gearboxes just sound so much nicer! Strangely today though, 69252 was seen operating 6s! I've certainly never seen B7s on 6s the whole time they've been in Plymouth. Generally the main allocations now are for the 1s and PR2s, but do stray on to 2s now and again. 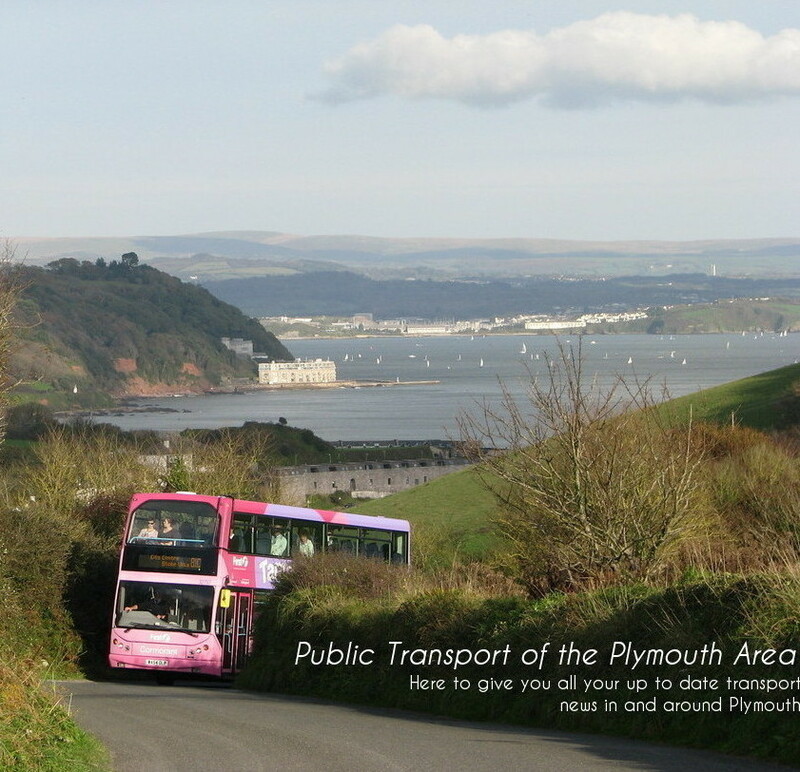 Will be interesting to see how much longer Plymouth retains the remaining 5. It would certainly be nice if we could keep them, they bring a real air of quality to the streets of Plymouth, and the FDC fleet as a whole. Taken at about 5:50am yesterday morning, A182 MNE basks in the morning sunlight getting prepared to do a wedding trip to Calstock. The second photo taken after returning shows both coaches and both Varios after undergoing their weekly checks at Foss Quay depot. 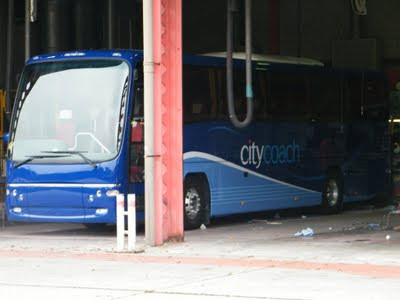 Plymouth Citycoach's new livery has been spotted today being prepared up at Milehouse. Indeed the rumors are true, it is now blue! 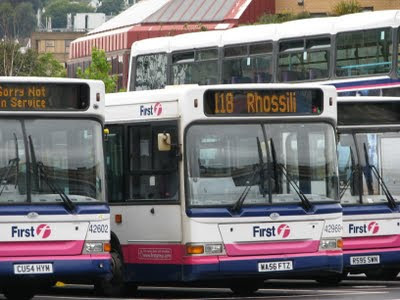 Very similar to the Moss livery used on the Isle of Wight as a coach subsidiary. Lets hope this isn't so they can swing vehicles round with ease! I don't think there's very much point about getting into a debate about Stenning's similar designs (presuming this is also by him? ), but the livery does look smart, but if anything, slightly bland. For my liking, it doesn't flow very well, there are too many large coloured areas, but none of it is in a nice constant pattern, it doesn't really all link in together that well. Let us know what you think though. Second photo of better quality thanks to Tom Pearce. I only posted mine to call 'Dibbs' as to being the first to photograph her at 08:32 this morning! There aren't many places left in the UK where you can still get a view like this! This is of course, Blackpool, where I spent 4 days of the family holiday within, and my god is the transport scene good! Plenty of Leyland Olympians both with TL11 and 6LXB engines to sample, along with Leyland Lions, Optare Excels, alongside the more common variety in the town. And of course, the legendary Blackpool trams are still very much at the forefront of passenger transport in the area, although much of the line is currently closed for re-furbishment work before the new trams arrive. Some of the older stock will be retained, but more on that at a later date! The photo depicts any normal day in Blackpool showing Ex-London Gardner 6LXB engined, D173 FYM, and Leyland TL11 engined, Ex Lothian, A704 YFS. Whey hey, some Dart variety in Plymouth! You're eyes do not deceive you, although I thought my own were doing so early on Friday morning! This is T471 JCV, Cornwall's RNLI liveried Dennis Dart, with the more rare (at least down here!) ALX 200* bodywork. To my knowledge, and several other people's, this is the first time this Dart has been in use in Plymouth. The ALX 200 as a whole has been used in Plymouth very occationally though when a Barnstaple based bus may stray onto one of the old full 86s into Plymouth. 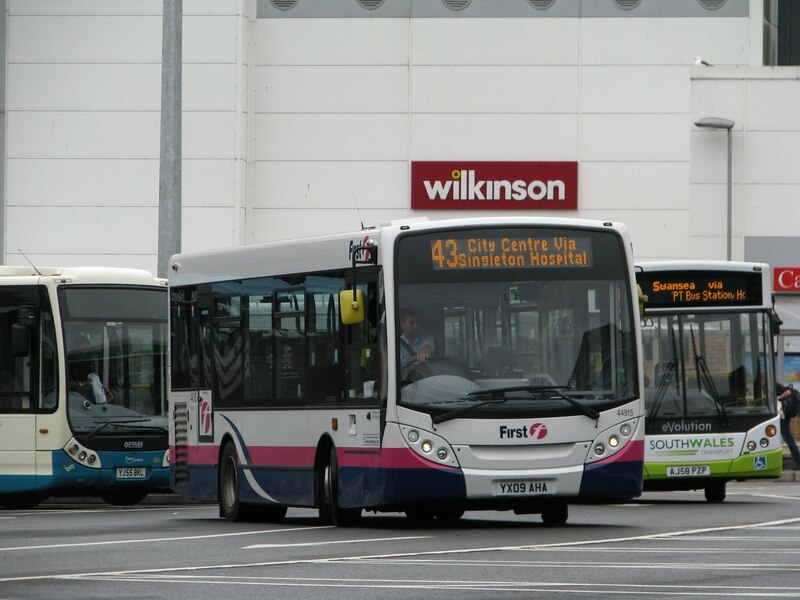 Certainly stands out among the sea of Plaxton bodied Darts in Plymouth, along with the very eye catching livery. It is thought she may now be a permanent placement in the city now the Marc Reddy is more heavily involved in the fund raising for the RNLI. 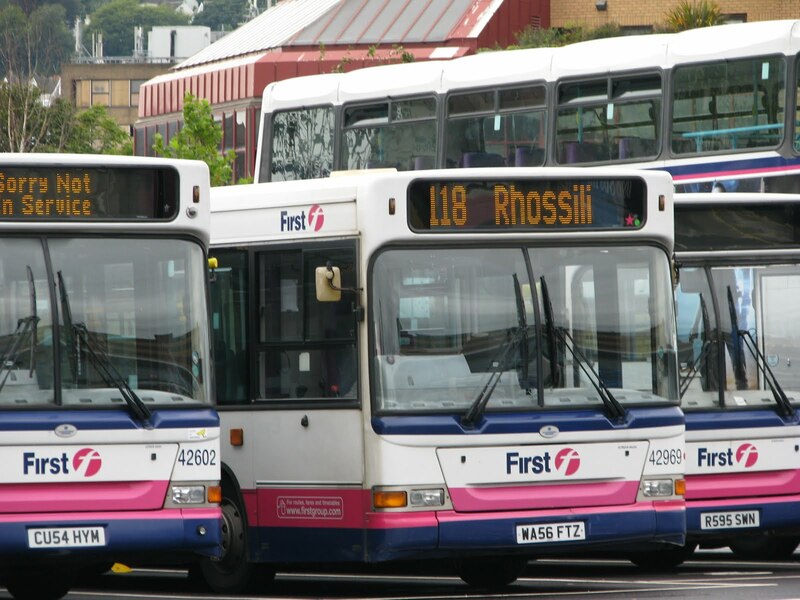 To read more on this head over to Plymothian Transit, who has a more extensive write up on Marc's new role! Plymouth never fails to disappoint, even on a random weekday! *Thanks to anon on correcting my lack of ALX knowledge! 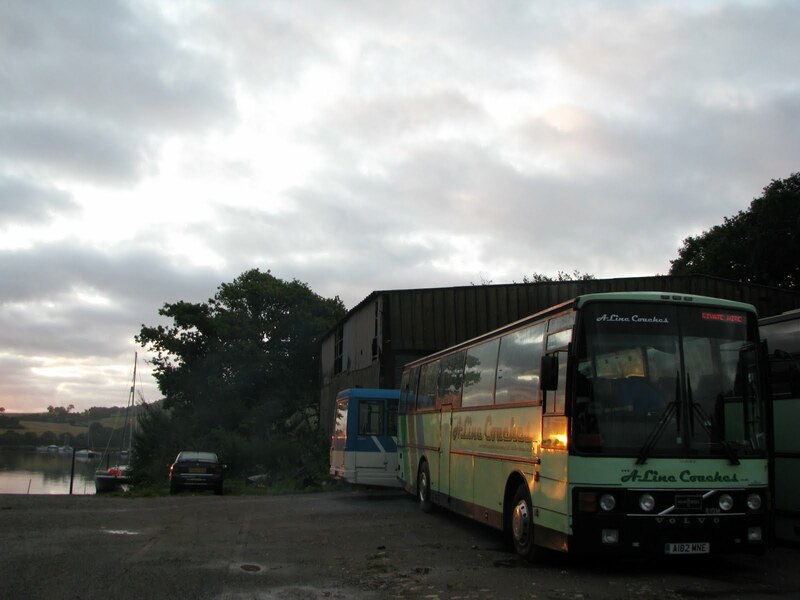 More Leyland action in Devon! Devonian Motor Services now operate this semi-opentop Leyland Olympian, A146 OFR on their service around Paignton. The fee is a very reasonable £3.50 for the round trip, so I thought it would be worth it to get some Gardner 6LXB action for the day, and she certainly didn't disapoint! The Gardner on A146 is superb, a very nice raw, growly sound coming from just behind me! The hills around Paignton really let us see what she's capable of, and gave plenty of opportunity for some high revving thrashes up the hills! Well worth a ride if you're in the area. 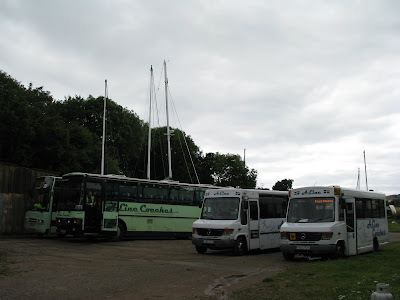 The service is also operated by various Leyland Atlanteans on other days, so its pot luck what you might end up with! A video has been included for your enjoyment. For a while now I've been wanting to experience a really good thrash on one of the few remaining K reg Leyland Olympians in Plymouth. The usual haunt of the 3 to Barne Barton really doesn't do them justice. Luckily, at the moment it seems pretty common to see two Leylands on X80s in daily use and so the box to tick for the day was a round on the X80 with a Leyland. thankfully, both K614 and K615 were operating on Friday, so I had a nice pair to choose from! 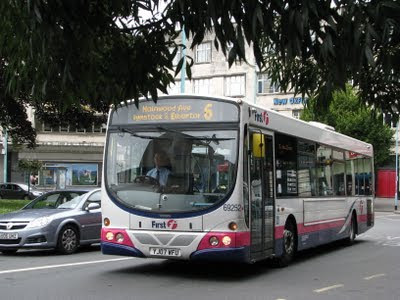 K615 has always seemed the stronger to me, so after wandering around Paignton and the like for a while, it was time for a thrash down to Plymouth! Weirdly, I think we actually went faster on the smaller roads, as the hills up on Rattery Bank and along the A38 proved too steep to really get up at any great speed. Therefore I have included some video taken firstly on the road from Totnes heading for the A38, and then again before Horrabridge. Enjoy! Jacketts' new X5 service commenced operation last Monday, operating from Plymouth to Truro via as many places as is possible to cram into 2hr 45minute journey! Monday saw the '54' reg Dart, but since then, has been operated using the much nicer L reg Mercedes 811! I'd much prefer the coach seats of the 811, rather than the Urban90s of a Dart *Correction, the Darts are fitted with proper seats! Sorry! . I really hope this service does well. 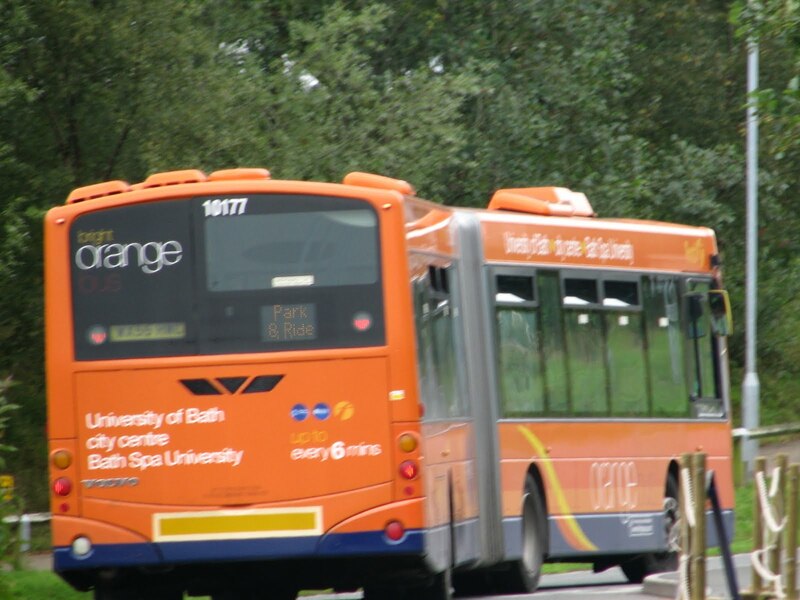 Serving places such as the Eden Project will surely bring in passengers, especially as they get money off their entry to Eden when using the service. The service takes 1hr 45minutes longer than the train journey, so won't be competing with that, but then again, its by no means designed to be an alternative to the train, unless you're an enthusiast who's fed up of Class 150s! I really hope this service does well, I may just have to come and have a go to experience it, it certainly looks like it would be an interesting ride! The route is at the moment on a 6 month trial period to see how passenger numbers float on the service. As has been mentioned elsewhere, this is a brave venture for a new company, and therefore we will wish them all the luck in the world in making this long lost link, a success!